Three brand new works that celebrate the joy of dance. Royal New Zealand Ballet Artistic Director Ethan Stiefel creates his first original work for the RNZB, a spirited comedy set in a Bavarian inspired beer hall. Expect laughter, lederhosen and virtuoso technique, as the whole company take up their steins and whirl away to the waltzes and polkas of Johann Strauss II and Josef Strauss. Former RNZB dancer Andrew Simmons, Christchurch-born and now living and working in Dresden, creates the eagerly-awaited follow-up to 2010’s haunting A Song in the Dark, a hit with audiences around New Zealand and with dance lovers in the UK and France on the company’s 2011 tour. Drawing on New Zealand’s wide open landscapes and set to the gentle minimalism of music by Dustin O’Halloran, Ludovico Einaudi and Olafur Arnalds, this new work promises to be a very special experience for dancers and audience alike. Venezuelan Javier De Frutos, choreographer of the RNZB’s award-winning Milagros (2003), The Celebrated Soubrette (2004) and Banderillero (2006) creates a new piece inspired by the Pacific – with musical influences encompassing everything from traditional chants to the vintage harmonies of the Yandall Sisters. De Frutos has made dance works to both critical and popular acclaim around the world. His choreography for the 2007 West End production of Cabaret received an Olivier Award, and his recent collaboration with Pet Shop Boys, The Most Incredible Thing, enjoyed two sell-out seasons at London’s Sadler’s Wells. 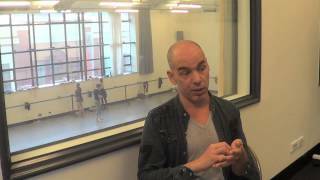 He continues to challenge the boundaries between the worlds of ballet, contemporary dance and musicals. The company, in outstanding form, deliver a night of spirited dancing in entertaining, thought provoking and beautiful works. Made to Move, the opener for the Royal New Zealand Ballet's 2013 season, was a spectacular series of three choreographies, utterly different and utterly delightful.